Gerhard G. Schmidt: teacher and churchman; born 8 February 1894 to Helena (Thiessen) (b. 1858) and Gerhard Schmidt in Alexandropol, South Russia. He was the fifth child in a family of four daughters and two sons. 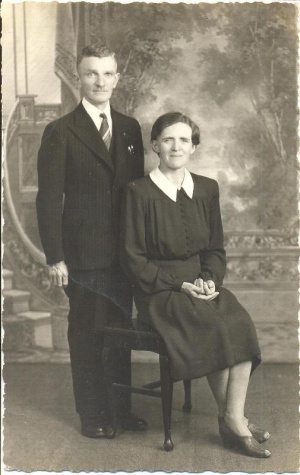 Gerhard's first wife was Helena Wiens (16 October 1903, Tiegerweide, Molotschna Mennonite Settlement, South Russia - 23 November 1955, Sardis, British Columbia, Canada), whom he married on 5 February 1944 at Pigeon Lake, Manitoba. Gerhard and Helena had one daughter, Irma, who was stillborn. After Helena's death from cancer, Gerhard married Katharina (Braun) Balzer (23 May 1890, Olgafeld, Fuerstenland, South Russia - 28 April 1964, Chilliwack, British Columbia) in November 1956. Gerhard was Katharina's fourth husband (previous husbands were Wilhelm Peters [1890-1941], Johann Peters [1876-1942], and Heinrich Balzer). Gerhard was married for the third time on 5 September 1965 in Clearbrook Mennonite Church to Sara "Sophie" Schmidt (26 December 1901, Aliessovo, Orenburg, Russia - 2 December 1996, Clearbrook, British Columbia). Gerhard died on 30 December 1977 and is buried in the Yarrow Cemetery, Yarrow, British Columbia. The Schmidt family moved to Nikolayevka (Village #9) in the Terek Mennonite Settlement in 1903. Gerhard was baptized at age 19 in June 1913. Together with his youngest sister Maria, Schmidt immigrated to Canada. They left from Suworowskaja, Caucasus on 13 September 1924 and arrived in Quebec City, Canada aboard the S. S. Minnedosa on 10 October. His first destination in Canada was Camrose, Alberta. The Schmidts were said to have a relative in Canada or the USA, namely a Rev. Heinrich Voth. From Camrose Schmidt gradually moved east, living briefly in eastern Saskatchewan before settling in Manitoba. Gerhard took teacher training at the Winnipeg Normal School. In the summer of 1931 Schmidt worked as a hired hand on the Kelloway farm near Killarney, just north of Lena, Manitoba. Here Schmidt had Terek connections; the whole clan of Aeltester Franz F. Enns came from the Terek. That fall he began teaching at Plum Hollow School near Lena where he stayed until the spring of 1940. From Lena he moved to teach in the village of Reinland, Manitoba from 1940 to 1945. While teaching in Reinland he married Helena Wiens at Pigeon Lake, Manitoba in 1944. Gerhard and Helena moved to Sardis, British Columbia (BC) in 1945 where a daughter Irma was stillborn. Diagnosed with cancer in 1953, Helena died in 1955. Gerhard married Katharina Balzer the following year. In British Columbia, Schmidt taught German, church history and Mennonite history at Bethel Bible Institute, Abbotsford, from 1945 to 1951. He was chair of the Conference of United Mennonite Churches of British Columbia in 1952-1953. This stint was short due to the contentious issue of whether an unordained person could be leader of the conference. Gerhard G. Schmidt spent his last years in Valhaven, a Church of God in Christ Holdemann retirement home at Abbotsford. Shortly before his death he was admitted to the Menno Home of which he had been a founding board member and executive member. According to Abram J. Neufeld, one of Schmidt’s earliest students at Plum Hollow, "G. G. Schmidt was the teacher par excellence." He organized meticulously, was well prepared for each day’s classes, fostered discipline and determination, and emphasized intellectual rigor and character formation. According to the school inspector, Mr. Parr, Plum Hollow was "the best of the 80 schools under his supervision" in the Turtle Mountain Municipality in the 1930s. At Plum Hollow Schmidt introduced the teaching of Bible in the German language for half an hour three times a week as allowed under the School Act, was active in Saturday German language teaching, and introduced adult winter evening classes with lectures and discussion on church history and current events. Both in the Lena church and in the village of Reinland he taught Sunday School. In the Lena church he also served on the Jugendvereinskomittee (Christian Endeavour Committee), as youth leader, and as church librarian. In Sardis (later Greendale) Mennonite Church he served as deacon. At Bethel Bible Institute some students found him uncomfortably strict. Besides being an influential teacher and leader himself, numerous of Schmidt’s students became successful farmers, educators, mission workers, and leaders in churches and conferences. Becker, Elsie, Adolf Ens, Helen Ens, Henry H. Epp, Margaret Franz, Les Friesen, Barry Lesser, Abram Neufeld, Margaret Nickel, Alf Redekopp, Anne Unger, Henry Wiebe. Interviews by author. 2012. Canadian Mennonite Board of Colonization Records. Volume 2360. Mennonite Heritage Centre Archives – Winnipeg. Dyck, John, Jacob Friesen, and Anna Ens. Lena Mennonite Church 1928-1968. Winnipeg: Book Committee, 2003: 14-15, 19. Friesen, Les. Menno Place: Mennonite Benevolent Society fiftieth anniversary, 1953-2003. Abbotsford, BC: Mennonite Benevolent Society, 2003: 21, 32, 123. GRANDMA (The Genealogical Registry and Database of Mennonite Ancestry) Database, 7.01 ed. Fresno, CA: California Mennonite Historical Society, 2012: #465510. "Helene Schmidt." Der Bote (18 January 1956): 8. "Katharina (Braun) Schmidt." Der Bote (28 April 1964): 7. Lehn, Cornelia. Frontier Challenge: A Story of the Conference of Mennonites in British Columbia. Clearbrook, BC: Conference of Mennonites in British Columbia, 1990: 75, 105, 147. "Maria (Schmidt) Kliever." Der Bote (2 March 1976): 12. Neufeld, Abram J. History of Plum Hollow School District #549, 1888-1962. Winnipeg, A.J. Neufeld, 1982: 11ff. "Search BC Archives." Province of British Columbia. Web. 21 March 2012. http://search.bcarchives.gov.bc.ca/sn-1AC22EA/gbsearch/Deaths. Unpublished handwritten genealogical record of Peter Peter Wiens 1869-1920 and Katharina Sawatzky 1873-1910 married in Lichtfelde, Russia in 1896. In the possession of Linda (Wiens) Aitken, Edmonton, AB and Margaret (Wiens) Franz, Winnipeg MB. Zacharias, Peter D. Reinland: An Experience in Community. Reinland, MB: Reinland Centennial Committee, 1976: 231, 266, 269. Ens, Anna Epp. "Schmidt, Gerhard G. (1894-1977)." Global Anabaptist Mennonite Encyclopedia Online. December 2012. Web. 22 Apr 2019. http://gameo.org/index.php?title=Schmidt,_Gerhard_G._(1894-1977)&oldid=103243. Ens, Anna Epp. (December 2012). Schmidt, Gerhard G. (1894-1977). Global Anabaptist Mennonite Encyclopedia Online. Retrieved 22 April 2019, from http://gameo.org/index.php?title=Schmidt,_Gerhard_G._(1894-1977)&oldid=103243. This page was last modified on 4 November 2013, at 08:43.